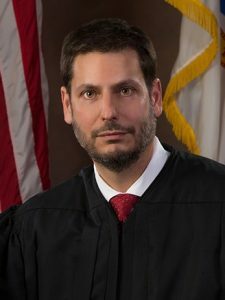 Judge Thomas D. “Bo” Winokur was appointed to the First District Court of Appeal by Governor Rick Scott on June 11, 2015. He joined the court after serving as Assistant General Counsel for the Executive Office of the Governor since 2011. He is in the unique position of having participated in the appointment of several of his colleagues on the court and can offer great insight on the appointment process. Judge Winokur brings to the court a depth of criminal appellate experience, which is of great value given the court’s large criminal caseload. He gained this experience through twelve years of service to the criminal appeals and capital litigation units of the Florida Office of Attorney General. Prior to his work for the State, Judge Winokur served in the Army JAG Corps in Fort Mead for three years and for one year working in private practice for a firm out of Live Oak, where his practice was broad. Judge Winokur is a double-Gator, having attended the University of Florida for both his undergraduate and law degrees. When asked to provide some advice on how practitioners can prepare the best possible briefs for the court, Judge Winokur offered the advice that an argument must be comprehensible upon a first reading. While he had heard that advice before, it is particularly pertinent now given the heavy caseload shouldered by the judges of the First District. Judge Winokur emphasizes that legal briefs submitted to the court are meant to be neither literature, nor pieces of scholarly work. Rather, they should be written so that someone unfamiliar with the particular area of the law addressed can easily grasp the issues at hand. Judge Winokur frequently reads briefs on a paper copy, though he does appreciate when hyperlinks and bookmarks are provided in electronic submissions. On the subject of oral argument, Judge Winokur hopes to never be the kind of judge who would brow beat the parties. He grants oral argument on a case by case basis and is more likely to grant it in areas of law with which he is less familiar. With a background of handling appeals for the Attorney General’s Office, he did not request oral argument often in practice and frequently opposed it. So far, oral argument has not changed his decision in a case, but it has reassured him of the position he felt inclined to take. Judge Winokur describes his work as “a dream come true” and exactly the kind of work he was meant to do. He looks forward to many years of service from the bench. Jennifer Shoaf Richardson is an associate in the Jacksonville office of Jackson Lewis. Her practice is devoted to representing management in workplace law related litigation from trial through appeal.